An environmental and human health advocate for more than 35 years, Wolfram Alderson ’04 has witnessed countless shifts in the scales of social justice. He worked on projects to end homelessness on Los Angeles’ Skid Row, established an urban forestry program in the Bay Area, and developed treatment programs to build up California’s most underserved populations. Now, as founding executive director for the Institute for Responsible Nutrition (IRN), Alderson’s latest endeavor brings him full circle to his passion for creating change that uplifts others. In 1979, Alderson, then just 19, worked with an interfaith agency to feed the hungry and establish the premier certified farmers’ markets in low-income communities of Los Angeles County. The first market opened in a Gardena church parking lot with four vendors and still operates today. The effort also ignited Alderson’s career dedicated to social change and knocking down barriers to sustainable, nutritious food. That conviction and drive recently attracted Alderson to the vision of Robert Lustig, MD, a San Francisco pediatric endocrinologist and a sugar-additive foe who penned New York Times bestseller Fat Chance (Plume, 2013). Lustig’s idea for a nonprofit fit well with Alderson’s decades of nonprofit start-up experience. “Wolfram is helping steer IRN toward becoming an influential voice in the debate overprocessed food versus real food,” said Lustig. With Alderson’s guidance, IRN earned nonprofit status in 2014 and set out to upend many of the practices that have gained a foothold in the food industry. The institute seeks to introduce a food-packaging label that would help consumers easily identify clean, additive-free products and push the Food and Drug Administration to remove sugar from its Generally Recognized As Safe (GRAS) database of food substances. “Doing so will force food manufacturers to stop adding bogus ingredients, which will mean the end of processed food and pave the way to producing real food that sustains health and nourishes families,” said Lustig. 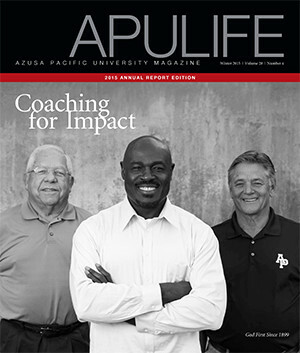 Originally published in the Winter '15 issue of APU Life. Download the PDF or view all issues.